Genesis Castle of Illusion: Starring Mickey Mouse (USA) in 18:23.45 by nesrocks. Castle of Illusion is one of the earlier games for the Genesis. 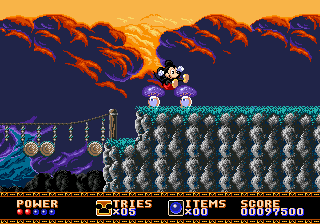 Mickey must collect seven jewels to reach the final boss and save Minnie. He attacks enemies either by flinging apples at them, or by smothering them with his cast-iron buttocks. This is about 47 seconds faster than the previous version by the same author. In addition, the publication was redone, and download statistics were zeroed in the process. The download count was 111 before that.